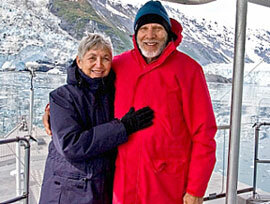 Steve and Linda Dashew have been sailing together for 40+ years. They courted on small racing catamarans in the 1960s. In 1975 they moved up to a 50-foot monohull for what was supposed to be a one-year cruise through the South Pacific. As sometimes happens, plans changed, and it was seven years before they came back to land. During their circumnavigation Steve and Linda home-schooled their two young daughters, built several advanced cruising yachts that became the foundation for a successful design and construction business, and wrote the first of eight books about life aboard and ocean seamanship. In the past 35 years, over sixty of their yachts (Deerfoot, Sundeer, Beowulf, and now the FPB series) have been launched. Steve and Linda themselves have cruised more than 250,000 miles. Their FPB prototype, FPB 83 Wind Horse, is a groundbreaking 83-foot (25m) ocean-crossing motor yacht in which they logged over 50,000 miles in five years. They launched the next evolution in the FPB paradigm, FPB 78-1 Cochise, in June of 2016, and barely a year later were up in Nova Scotia with over 15,000 nautical miles under the hull. More than 250 of their articles have appeared in magazines around the world. Steve and Linda blog for SetSail about their experiences cruising. Check back frequently to join in on their latest adventures, and browse through the archives for previous SetSail articles from the past decade. SetSail started life in 1997 as a simple website to share a few ideas with cruising friends. Then several bluewater veterans asked to join the fun. Before we knew it we had a fleet of half a dozen reporters chiming in from around the world and were getting a couple million hits a month. The bandwidth and administration grew accordingly, to the point where it was starting to interfere with cruising, exploring new frontiers, and family responsibilities. This is, after all, supposed to be fun! With that in mind, we changed the structure of SetSail so that we can continue to cruise and share what we are learning and experiencing with SetSailors. We imported all our old articles into this WordPress blog, which makes it easier for us to post articles while we’re out cruising. The search engine and navigation make it easier to find the specific articles you’re looking for. Plus quite a few more new features for the website have risen above the horizon. Many of you have been traveling online with us for the past 21 years. We welcome you aboard for the next leg of the journey! High average cruising speed, because it is the single most important factor in reducing weather risks, thereby improving passaging comfort and, ultimately, safety. Plus, going fast is fun. Heavy weather capability, which allows us greater flexibility in deciding when and where to go. And peace of mind while we’re out there. Structural safety factors to deal not only with the sea, but to reduce the need to visit a boatyard in case of operator error – read, grounding – so we can continue to cruise while taking the occasional bump in stride. Efficient but simple systems that let us operate far from outside assistance, with the comfort and ambiance that keeps all members of the crew content, without being generator-dependent. Interiors designed for comfort at sea and in port, immersing us fully in the surrounding beauty. Fuel capacity for a full season or more of cruising, so we can maintain our high average speeds and have the option of refueling when and where convenient. A low profile exterior that conceals a luxurious interior, allowing owners to blend in more easily in remote areas. Over two million miles of accumulated cruising from a relatively small fleet of yachts shows that when you get this formula right, the horizon beckons. Steve & Linda work from their land office in Tucson, Arizona, as well as afloat. 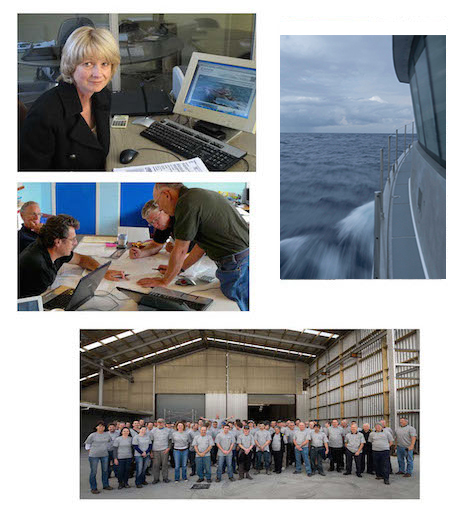 The dedicated crew at Circa Marine, led by Bruce Farrand, have managed construction and delivery in Whangarei, New Zealand. The FPB 78 and two FPB 70s currently in build will be the last of this line to be constructed. Sue Grant, the managing director at Berthon Int’l, has been instrumental in helping us develop the European market for FPBs, as well as our global brand awareness. Now that we are no longer building new FPBs, Sue Grant and Berthon are handling the brokerage market of all FPBs for Dashew Offshore, Ltd. If you’d like to chat with Sue about any FPB which comes on the brokerage market, she can be reached at Sue.Grant@Berthon.Co.UK. Sarah Dashew holds down the SetSail fort from her home office in Los Angeles, CA. She manages web content, along with the occasional flight to New Zealand to document FPB goings on and coordinate with clients.